I foolishly do not remember the exact name of this delightful cocktail, but let’s just say that going to my favorite cocktail bar while on the wagon was an experience and then some. Luckily, someone nearby ordered this drink that looked amazing, so I asked the bartender what it was. He explained it, and when I asked if I could get it nonalcoholic, it was like I’d challenged him and he’d responded “Challenge… accepted!! 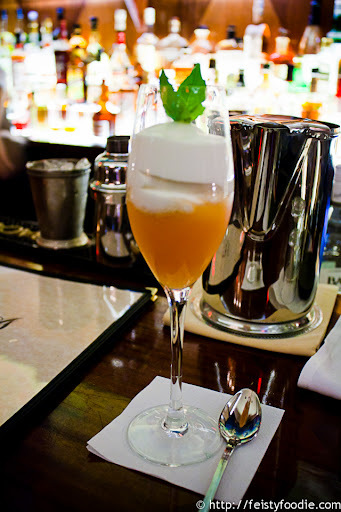 !” Peach puree topped with a cloud of mascarpone, and a bit of lemon zest or essence. It was delicious, though after letting it sit for a while, it became a bit too bitter for me. Either way – genius, and I didn’t feel at all odd to sit in a cocktail bar – at the bar, no less – while chatting with a friend and eating what looked like dessert instead of having a cocktail. Love. I haven’t really ever posted about Angel’s Share, but it’s easily my favorite cocktail bar in NYC. Definitely check it out if you get a chance. Was it too thick to drink? For some reason, I’m thinking mango lassi thickness.